Patti Smith’s Devotion is a concise and special compilation consisting of three works that explore the author’s creative process. Two narrative essays bookend the eponymous story “Devotion”, a short and bittersweet tale of a young Estonian refugee named Eugenia who dreams of figure skating. Bound in a pleasing cardinal red, this little tome is compact and disciplined, much like Smith’s writing. Devotion is a must for longtime fans of Patti Smith’s writing, and devotees will find satisfaction in small references that tie back to her previous works Just Kids and M Train. In Devotion’s opening essay, “How the Mind Works,” we meet Smith as she embarks on her daily routine, headed to her local café to write. She prepares for a flight to France, which will leave later that evening, and there she will attend a number of book-related events lined up by her publisher. For Smith, this journey is also an opportunity to revisit some of her favorite historical sites and commune with the spirits of her idols. As she wanders the streets of Paris, she recalls moments from a similar trip with her sister as a young woman. It is remarkable to see the spark of youthful adoration hasn’t diminished in Smith’s old age. 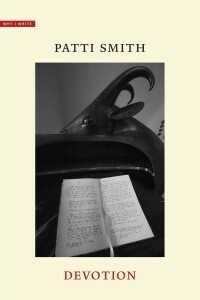 While the central short story is nothing earth-shattering, it contains the simplicity as well as the sensuality that are both hallmarks of Smith’s voice as a writer. “Devotion” is a tale of a young woman who is consumed by a creative passion, but it is also a story of a love affair, as well as abuse. While these heavier themes are touched upon, it is evident that Smith does not take much of an interest in passing moral judgments, and rather just wishes to conjure a beautiful (albeit complicated) story. As the fictional narrative of “Devotion” unfolds, Smith provides her readers with small insights to her creative process, revealing bits and pieces that have been appropriated from the people and places she encounters on the journeys detailed in the collection’s other essays. While the short story at the center of this book may not gel on its own, Devotion will captivate readers as it uncovers two critical aspects of Smith’s creative process — both her monastic discipline and routine as well as her trusting embrace of happenstance and outside input as catalysts for invention. A legendary musician, poet, and visual artist, one cannot help but be struck by the unassuming nature of Smith’s autobiographical writing. Her voice retains a striking humility, and the regard she still holds for her idols is remarkable. As a whole, Devotion is a refreshing reminder that you are never too old or too famous to be inspired by the works of others.